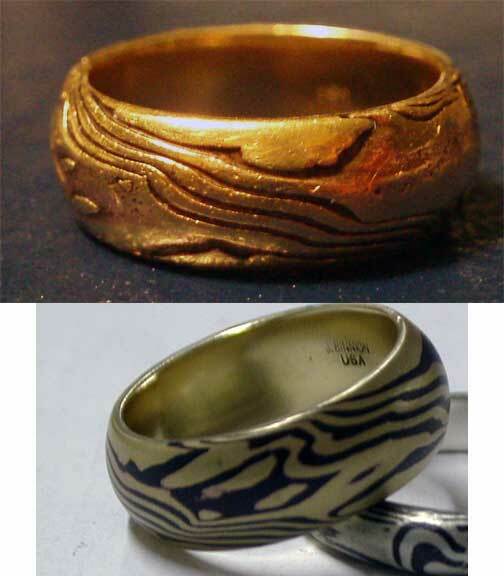 The copper and silver ring before the test. 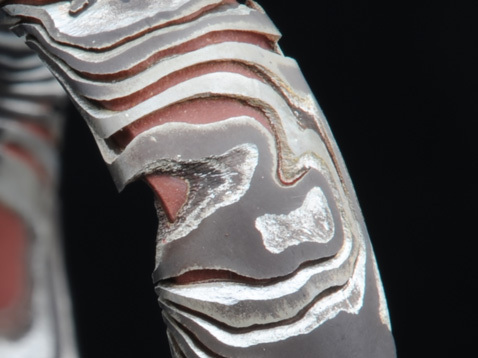 Note: Since this was first posted several people have somehow assumed this is a problem with mokume gane, it is not It is a problem with physically connecting any two metals in a wet environment. Rings worn daily are the jewelry items that will typically be affected due to the fairly constant wetting of ones hands. 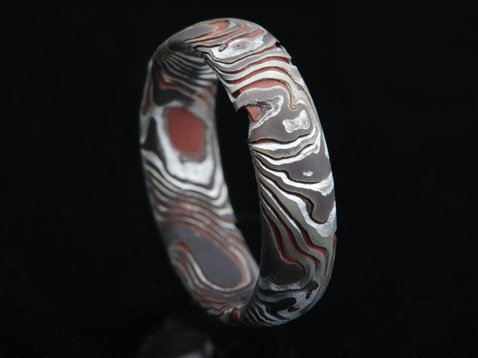 The corrosion will occur if one or more of the metals in the ring is a base metal. This corrosion will not happen with rings made entirely of precious metals. Also this test is an accelerated aging test you will not see this level of effect in this short a time unless the ring was kept wet constantly, but it will occur. How fast will vary widely with the individual and their environment. 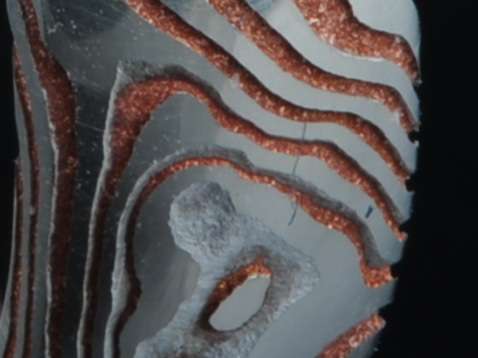 I have seen this level of corrosion over the period of a couple of years on some individuals rings that had copper or shakudo elements in contact with gold. When you join two metals together in a ring beyond your aesthetic creation you also create something that under the right circumstances can destroy all your work. Two metals joined together in the presence of an electrolyte create an electrolytic cell which is in essence a battery. In a ring the electrolyte is provided by the water you constantly expose your hands to through washing, sweat, swimming etc. One of the metals will be more electrically positive or anodic and one will be more electrically negative or cathodic. The the difference between these poles is measured in volts. When exposed to the electrolyte the anode will dissolve and supply ions to the electrolyte. Just like electroplating or electroetching. The higher the voltage the greater the activity and the faster the anode will dissolve. Which metal is the anode and which is the cathode will be determined by their atomic properties but can be looked up in a chart called a galvanic series. The higher a metal is on this chart the more noble it is and the more cathodic or negative it is. You will note the precious metals are at the top of the chart and that is why you will occasionally hear them referred to as noble metals. So what all does this mean? 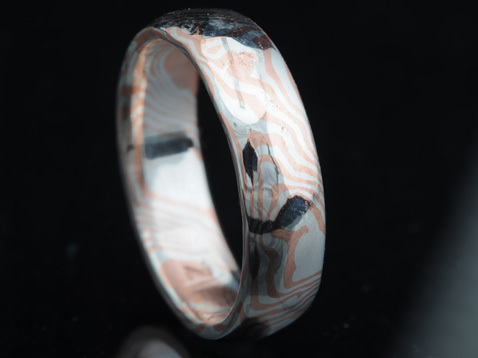 If you combine silver and copper as in the ring above you will have an electrolytic cell where the silver is the cathode and the copper is the anode . This ring in this test is mokume but it will not matter how the copper and silver are bonded, solder or rivet will still create an electrolytic cell. If you place it in contact with an electrolyte then the copper will give off ions to the electrolyte and dissolve. How fast is the next question, or at least that is what I wanted to know. So I set up a test to find out. Believe it or not there are defined standards for test solutions to simulate human sweat for testing things like colorfastness of fabric dyes and the like. Another one is used to test for nickel release in jewelry items by the EU. So I looked up several of them and picked one that seemed to be both easy to make and not too concentrated. I placed this mixture into a beaker at room temperature and suspended the ring in it with nylon fishing line. I thought I would check on it once a week or so but I took a peek at day one to see if anything had happened. Much to my surprise etching had become visible in only 24 hours. 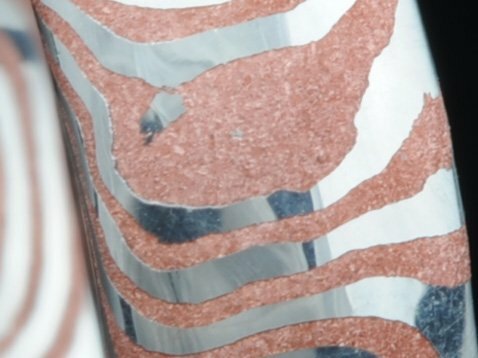 The copper showed definite signs of etching in just 24 hours The crystal structure of the copper is clearly visible where the sweat solution has begun to etch it. So I decided to check back in another 2 days. At this point the etching was quite pronounced. Very pronounced crystal structure revealed. At 7 days the ring was severely etched. In some places the copper had been totally eaten away. By day 10 I decided to stop the experiment as I felt I had learned as much as I was going to. 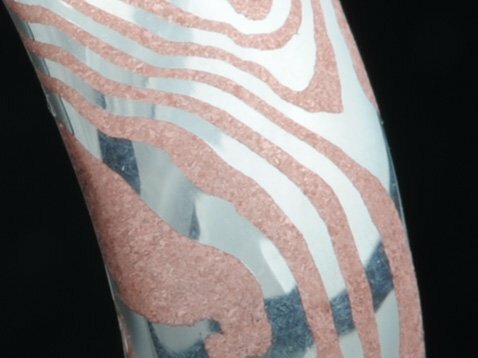 At this point the copper rich areas of the sterling were beginning to be affected by the solution and in many places the copper was totally gone. In another few days the ring would have fallen apart. Quite beautiful in a very distressed way. So what should one take away from this? 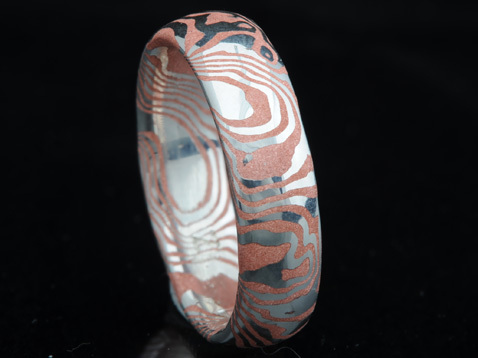 First and foremost mixed metal rings where copper or other base metals are a part of the mix are not going to have a long lifetime. 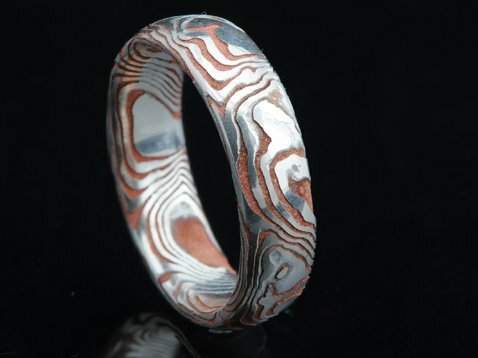 So making wedding rings out of copper/silver or gold/copper, gold/shakudo silver/shibuichi etc. may not be a good idea. Beyond that you need to ask yourself if your clients will react well to rings that self destruct. Several folks have wondered if this etching happens in real life. Here is a ring that I made for a client in 18k yellow gold and shakudo. The top image is after about 3 years of wear and the bottom image is how it looked when I shipped it. This is fascinating. Thank you for posting the results of your experiment!